I’ve had to let this book simmer in my mind for a few days before attempting a review. There is so much going on in Grace McCleen’s debut novel that I can’t easily categorize the book, much less summarize it. 10 year-old Judith McPherson is growing up a social outcast because of her and her father’s devout faith. She is bullied and lonely, expecting Armageddon at any moment. In her attempt to control her environment, she creates her own perfect world out of trash; hence, The Land of Decoration. 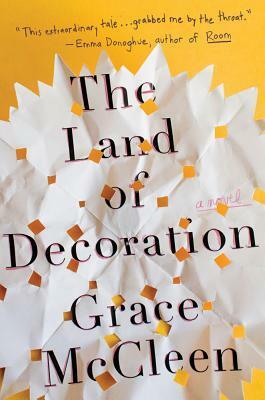 In Grace’s creation, McCleen piles Biblical allegory on top of metaphor on top of simile. Once there was a man and a woman. When they met sparks flew, meteors collided, asteroids turned cartwheels and atoms split. He loved her from here to eternity, she loved him to the moon and back. They were two peas in a pod, heads and tails and noughts and crosses. Judith’s faith is so deep, so pure, that she soon not only hears the voice of God, but becomes his instrument. She performs miracles and struggles mightily with this almighty power. She discovers that the “doing” is easy, it’s the “undoing” that’s really hard. Sounds unbelievable, right? Well it is. And it isn’t. McCleen does an admirable job of suspending disbelief. I found it impossible to doubt Judith even as the purely rational side of my brain felt she had crossed the line between faith and fanaticism. Miracles don’t have to be big, and they can happen in the unlikeliest places. Sometimes they are so small people don’t notice. Sometimes miracles are shy. They brush against your sleeve, they settle on your eyelashes. They wait for you to notice, then melt away. Lots of things start by being small. It’s a good way to begin, because no one takes any notice of you. You’re just a little thing beetling along, minding your own business. Then you grow. McCleen puts enough doubt and faith into her other characters that we get to see a broad spectrum of belief without having the author pass direct judgment. We, as readers, are also direct witnesses to the sad state of emotional neglect in which Judith is trying to grow up. In this regard, the novel is in more familiar territory. I could identify with this kind of crisis, which the author handles with subtlety and intelligence. I really loved seeing how they attempted to take care of each other in the best ways they knew. But most I’d the time I don’t say much to Father and he doesn’t say much to me, and this is the biggest problem we have, because all the time we are not saying things, the air is filled with the things we could. I am always trying to hook one of these things down, but they are usually out of reach. My biggest obstacle was that I never quite committed to Judith’s world. Faith is a leap; you’re here, the thing you want is there; there’s a space between you. You just have to jump. The author required me to make this leap and I just couldn’t get there. So I was left wondering if this book is brilliant, or just bold.